(Chris Detrick | The Salt Lake Tribune) Students at Highland High School in Salt Lake City gather on the football field to participate in a nationwide demonstration for better gun safety laws Thursday, March 15, 2018. Students at more than 30 schools along the Wasatch Front, nearly all of them high schools, particiapted in the 17-minute walkout — one minute for each of the Florida students killed. (Chris Detrick | The Salt Lake Tribune) Freshman Ben Malovich participates in a nationwide demonstration for better gun safety laws at Highland High School in Salt Lake City Thursday, March 15, 2018. Students at more than 30 schools along the Wasatch Front, nearly all of them high schools, particiapted in the 17-minute walkout — one minute for each of the Florida students killed. 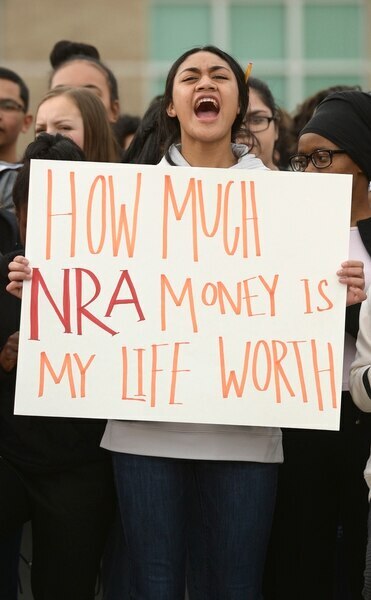 (Chris Detrick | The Salt Lake Tribune) Senior Zina Runyan participates in a nationwide demonstration for better gun safety laws at Highland High School in Salt Lake City Thursday, March 15, 2018. Students at more than 30 schools along the Wasatch Front, nearly all of them high schools, particiapted in the 17-minute walkout Ñ one minute for each of the Florida students killed. (Chris Detrick | The Salt Lake Tribune) Students at Highland High School in Salt Lake City gather on the football field to participate in a nationwide demonstration for better gun safety laws Thursday, March 15, 2018. Students at more than 30 schools along the Wasatch Front, nearly all of them high schools, particiapted in the 17-minute walkout — one minute for each of the Florida students killed. Scott Sommerdorf | The Salt Lake Tribune Students at Brighton High observe a minute of silence for each sign held up for all of the 17 students and staff killed at Marjory Stoneman Douglas High School, during their walkout at Brighton High School, Wednesday, March 14, 2018. (Leah Hogsten | The Salt Lake Tribune) Students at east High School in Salt Lake City gather in front of the school to participate in a nationwide demonstration for better gun safety laws on March 14, 2018. (Chris Detrick | The Salt Lake Tribune) Students at Highland High School in Salt Lake City gather on the football field to participate in a nationwide demonstration for better gun safety laws Thursday, March 15, 2018. Students at more than 30 schools along the Wasatch Front, nearly all of them high schools, particiapted in the 17-minute walkout — one minute for each of the Florida students killed. 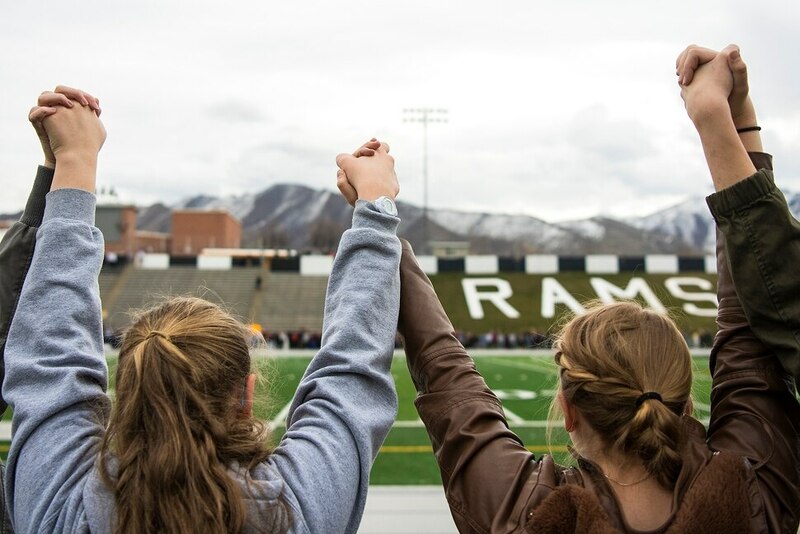 (Chris Detrick | The Salt Lake Tribune) Students at Highland High School in Salt Lake City gather on the football field to participate in a nationwide demonstration for better gun safety laws on March 14, 2018. (Francisco Kjolseth | The Salt Lake Tribune) Students at West High School in Salt Lake City distribute speech notes before participating in a nationwide demonstration for better gun safety laws on March 14, 2018. (Scott Sommerdorf | The Salt Lake Tribune) Students at Brighton High School in Cottonwood Heights start to gather to participate in a nationwide demonstration for better gun safety laws on March 14, 2018. 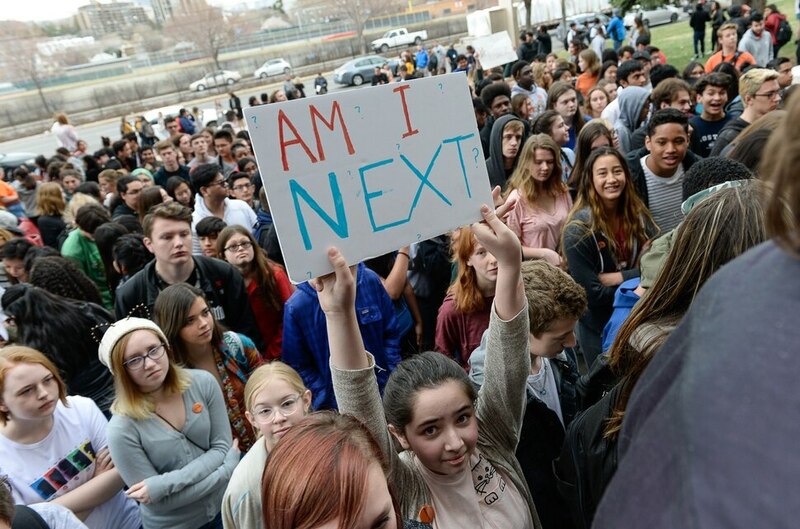 (Francisco Kjolseth | The Salt Lake Tribune) Students at West High School in Salt Lake City participate in a nationwide demonstration for better gun safety laws on March 14, 2018. (Scott Sommerdorf | The Salt Lake Tribune) Students at Brighton High School in Cottonwood Heights hold cards with the names of those killed during a school shooting in Parkland, Fla., as they participate in a nationwide demonstration for better gun safety laws on March 14, 2018. (Scott Sommerdorf | The Salt Lake Tribune) Students at Brighton High School in Cottonwood Heights hold cards with the names of those killed during a school shooting in Parkland, Fla., as they participate in a nationwide demonstration for better gun safety laws on March 14, 2018. (Scott Sommerdorf | The Salt Lake Tribune) Students at Brighton High School in Cottonwood Heights hold cards with the names of those killed during a school shooting in Parkland, Fla., as they participate in a nationwide demonstration for better gun safety laws on March 14, 2018. (Chris Detrick | The Salt Lake Tribune) Students at Highland High School in Salt Lake City gather on the football field to participate in a nationwide demonstration for better gun safety laws on March 14, 2018. (Chris Detrick | The Salt Lake Tribune) Senior Zina Runyan participates in a nationwide demonstration for better gun safety laws at Highland High School in Salt Lake City Thursday, March 15, 2018. Students at more than 30 schools along the Wasatch Front, nearly all of them high schools, particiapted in the 17-minute walkout Ñ one minute for each of the Florida students killed. (Chris Detrick | The Salt Lake Tribune) Students at Highland High School in Salt Lake City gather on the football field to participate in a nationwide demonstration for better gun safety laws Thursday, March 15, 2018. Students at more than 30 schools along the Wasatch Front, nearly all of them high schools, particiapted in the 17-minute walkout — one minute for each of the Florida students killed. (Chris Detrick | The Salt Lake Tribune) Student Organizer Ermiya Fanaeian speaks during a nationwide demonstration for better gun safety laws at Highland High School in Salt Lake City Thursday, March 15, 2018. Students at more than 30 schools along the Wasatch Front, nearly all of them high schools, particiapted in the 17-minute walkout Ñ one minute for each of the Florida students killed. (Chris Detrick | The Salt Lake Tribune) Students at Highland High School in Salt Lake City gather on the football field to participate in a nationwide demonstration for better gun safety laws Thursday, March 15, 2018. Students at more than 30 schools along the Wasatch Front, nearly all of them high schools, particiapted in the 17-minute walkout — one minute for each of the Florida students killed. (Chris Detrick | The Salt Lake Tribune) Student Organizer Ermiya Fanaeian speaks during a nationwide demonstration for better gun safety laws at Highland High School in Salt Lake City Thursday, March 15, 2018. Students at more than 30 schools along the Wasatch Front, nearly all of them high schools, particiapted in the 17-minute walkout Ñ one minute for each of the Florida students killed. (Chris Detrick | The Salt Lake Tribune) Students at Highland High School in Salt Lake City gather on the football field to participate in a nationwide demonstration for better gun safety laws Thursday, March 15, 2018. Students at more than 30 schools along the Wasatch Front, nearly all of them high schools, particiapted in the 17-minute walkout — one minute for each of the Florida students killed. (Francisco Kjolseth | The Salt Lake Tribune) West High School students walk out of classes in Salt Lake, during a student walkout on Wed. March 14, 2018. Students in Utah and around the country planned the large-scale coordinated demonstration to protest gun violence and memorialize victims of last month's mass shooting at Marjory Stoneman Douglas High School in Parkland, Fla. (Francisco Kjolseth | The Salt Lake Tribune) West High School students walk out of classes in Salt Lake, during a student walkout on Wed. March 14, 2018. Students in Utah and around the country planned the large-scale coordinated demonstration to protest gun violence and memorialize victims of last month's mass shooting at Marjory Stoneman Douglas High School in Parkland, Fla. (Francisco Kjolseth | The Salt Lake Tribune) Balloons representing the 17 killed in last month's mass shooting at Marjory Stoneman Douglas High School in Parkland, Fla., are released by West High School students in Salt Lake, during a student walkout on Wed. March 14, 2018. Students in Utah and around the country planned the large-scale coordinated demonstration to protest gun violence. (Francisco Kjolseth | The Salt Lake Tribune) Balloons representing the 17 killed in last month's mass shooting at Marjory Stoneman Douglas High School in Parkland, Fla., are released by West High School students in Salt Lake, during a student walkout on Wed. March 14, 2018. Students in Utah and around the country planned the large-scale coordinated demonstration to protest gun violence. (Francisco Kjolseth | The Salt Lake Tribune) West High School sophomore Andie Madsen, 15, returns to classes following a students walk out in Salt Lake, Wednesday morning March 14, 2018. Students in Utah and around the country planned the large-scale coordinated demonstration to protest gun violence and memorialize victims of last month's mass shooting at Marjory Stoneman Douglas High School in Parkland, Fla. (Francisco Kjolseth | The Salt Lake Tribune) West High School sophomore Vinay Bandiatmakur, 15, joins a student walkout on Wed. March 14, 2018. Students in Utah and around the country planned the large-scale coordinated demonstration to protest gun violence and memorialize victims of last month's mass shooting at Marjory Stoneman Douglas High School in Parkland, Fla. (Francisco Kjolseth | The Salt Lake Tribune) West High School students listen to fellow students demand for gun reform and school safety after walking out of classes in Salt Lake, during a student walkout on Wed. March 14, 2018. Students in Utah and around the country planned the large-scale coordinated demonstration to protest gun violence and memorialize victims of last month's mass shooting at Marjory Stoneman Douglas High School in Parkland, Fla. (Francisco Kjolseth | The Salt Lake Tribune) West High School students organize themselves during a student walkout on Wed. March 14, 2018. Students in Utah and around the country planned the large-scale coordinated demonstration to protest gun violence and memorialize victims of last month's mass shooting at Marjory Stoneman Douglas High School in Parkland, Fla. (Francisco Kjolseth | The Salt Lake Tribune) Balloons representing the 17 killed in last month's mass shooting at Marjory Stoneman Douglas High School in Parkland, Fla., are released by West High School students in Salt Lake, during a student walkout on Wed. March 14, 2018. Students in Utah and around the country planned the large-scale coordinated demonstration to protest gun violence. (Francisco Kjolseth | The Salt Lake Tribune) West High School students walk out of classes in Salt Lake, during a student walkout on Wed. March 14, 2018. Students in Utah and around the country planned the large-scale coordinated demonstration to protest gun violence and memorialize victims of last month's mass shooting at Marjory Stoneman Douglas High School in Parkland, Fla. (Francisco Kjolseth | The Salt Lake Tribune) West High School students walk out of classes in Salt Lake, during a student walkout on Wed. March 14, 2018. Students in Utah and around the country planned the large-scale coordinated demonstration to protest gun violence and memorialize victims of last month's mass shooting at Marjory Stoneman Douglas High School in Parkland, Fla. (Francisco Kjolseth | The Salt Lake Tribune) West High School 7th grader Sadie Nelson-Stippich, 12, joins fellow students after walking out of classes in Salt Lake, during a planned student walkout on Wed. March 14, 2018. Students in Utah and around the country planned the large-scale coordinated demonstration to protest gun violence and memorialize victims of last month's mass shooting at Marjory Stoneman Douglas High School in Parkland, Fla. (Francisco Kjolseth | The Salt Lake Tribune) West High School senior Abena Bakenra, 17, describes looking for the best places to hide every time she walks into a classroom as she talks about the need for school safety during a student walkout on Wed. March 14, 2018. Students in Utah and around the country planned the large-scale coordinated demonstration to protest gun violence and memorialize victims of last month's mass shooting at Marjory Stoneman Douglas High School in Parkland, Fla. (Francisco Kjolseth | The Salt Lake Tribune) West High School students listen to fellow students demand for gun reform and school safety after walking out of classes in Salt Lake, during a student walkout on Wed. March 14, 2018. Students in Utah and around the country planned the large-scale coordinated demonstration to protest gun violence and memorialize victims of last month's mass shooting at Marjory Stoneman Douglas High School in Parkland, Fla. (Francisco Kjolseth | The Salt Lake Tribune) Mayor Jackie Biskupski and Police Chief Mike Brown attend the West High School student walkout on Wed. March 14, 2018. Students in Utah and around the country planned the large-scale coordinated demonstration to protest gun violence and memorialize victims of last month's mass shooting at Marjory Stoneman Douglas High School in Parkland, Fla. (Francisco Kjolseth | The Salt Lake Tribune) Balloons representing the 17 killed in last month's mass shooting at Marjory Stoneman Douglas High School in Parkland, Fla., are released by West High School students in Salt Lake, during a student walkout on Wed. March 14, 2018. Students in Utah and around the country planned the large-scale coordinated demonstration to protest gun violence. (Francisco Kjolseth | The Salt Lake Tribune) West High School junior Zeia Woodruff, 16, encourages her fellow students to register to vote during a student walkout on Wed. March 14, 2018. Students in Utah and around the country planned the large-scale coordinated demonstration to protest gun violence and memorialize victims of last month's mass shooting at Marjory Stoneman Douglas High School in Parkland, Fla. Scott Sommerdorf | The Salt Lake Tribune Students at Brighton High observe a minute of silence for each sign held up for all of the 17 students and staff killed at Marjory Stoneman Douglas High School, during their walkout at Brighton High School, Wednesday, March 14, 2018. Scott Sommerdorf | The Salt Lake Tribune Students at Brighton High observe a minute of silence for each of the 17 students and staff killed at Marjory Stoneman Douglas High School, during their walkout at Brighton High School, Wednesday, March 14, 2018. Scott Sommerdorf | The Salt Lake Tribune at Brighton High School, Wednesday, March 14, 2018. Scott Sommerdorf | The Salt Lake Tribune Meghan Taylor wipes away some tears after she and other students observed a minute of silence for each of the 17 students and staff killed at Marjory Stoneman Douglas High School, during their walkout at Brighton High School, Wednesday, March 14, 2018. Scott Sommerdorf | The Salt Lake Tribune James Grace Mackey, left, and Dahlia Dangerfield, Brighton High students hug as students who walked out of class head back to school after coming together to observe a moment of silence for each of the 17 students and staff killed at Marjory Stoneman Douglas High School, during their walkout at Brighton High School, Wednesday, March 14, 2018. Scott Sommerdorf | The Salt Lake Tribune Students at Brighton High observe a minute of silence for each sign held up for all of the 17 students and staff killed at Marjory Stoneman Douglas High School, during their walkout at Brighton High School, Wednesday, March 14, 2018. Scott Sommerdorf | The Salt Lake Tribune Student organizer Isaac Reese reads through each of the 17 students and staff killed at Marjory Stoneman Douglas High School, during their walkout at Brighton High School, Wednesday, March 14, 2018. 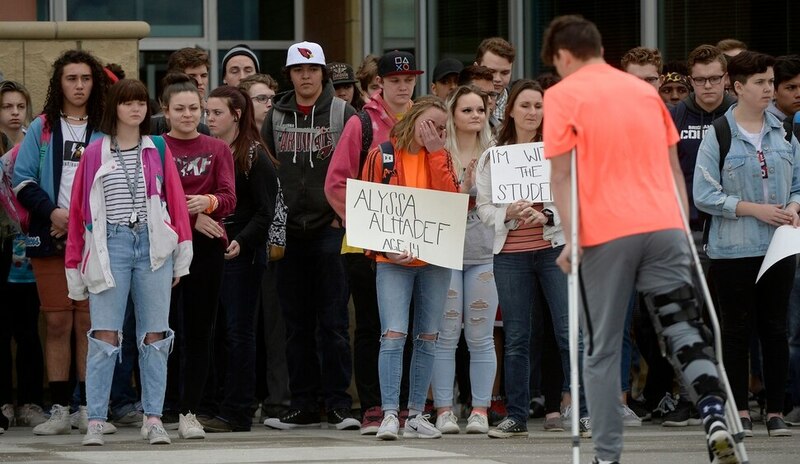 Scott Sommerdorf | The Salt Lake Tribune Brighton High students held up signs with names on both sides as the names of each of the 17 students and staff killed at Marjory Stoneman Douglas High School, were read aloud during their walkout at Brighton High School, Wednesday, March 14, 2018. Scott Sommerdorf | The Salt Lake Tribune Student organizer Isaac Reese addresses the crowd of students who walked out of class at Brighton High and gathered in the football stadium. The students read aloud the names of each of the 17 students and staff killed at Marjory Stoneman Douglas High School, during their walkout at Brighton High School, Wednesday, March 14, 2018. Scott Sommerdorf | The Salt Lake Tribune Student organizer Isaac Reese addresses the crowd of students who walked out of class at Brighton High and gathered in the football stadium. The students read aloud the names of each of the 17 students and staff killed at Marjory Stoneman Douglas High School, during their walkout at Brighton High School, Wednesday, March 14, 2018. Scott Sommerdorf | The Salt Lake Tribune Tailyn Bradford holds up a sign with the name Aaron Fels, one of the names of the 17 students and staff killed at Marjory Stoneman Douglas High School, during their walkout at Brighton High School, Wednesday, March 14, 2018. Scott Sommerdorf | The Salt Lake Tribune Students at Brighton High observe a minute of silence for each sign held up for all of the 17 students and staff killed at Marjory Stoneman Douglas High School, during their walkout at Brighton High School, Wednesday, March 14, 2018. Scott Sommerdorf | The Salt Lake Tribune Student organizer Isaac Reese addresses the crowd of students who walked out of class at Brighton High and gathered in the football stadium. The students read aloud the names of each of the 17 students and staff killed at Marjory Stoneman Douglas High School, during their walkout at Brighton High School, Wednesday, March 14, 2018. (Leah Hogsten | The Salt Lake Tribune) East High School student Edith Lutui left school to raise awareness and push for change with her classmates. Exactly one month after 17 people were killed at Marjory Stoneman Douglas High School in Parkland, survivors of the massacre joined tens of thousands of students across the United States by walking out of school, Wednesday, March 14, 2018. (Leah Hogsten | The Salt Lake Tribune) East High School student Sione Fineu left school to raise awareness and push for change with his classmates. Exactly one month after 17 people were killed at Marjory Stoneman Douglas High School in Parkland, survivors of the massacre joined tens of thousands of students across the United States by walking out of school, Wednesday, March 14, 2018. 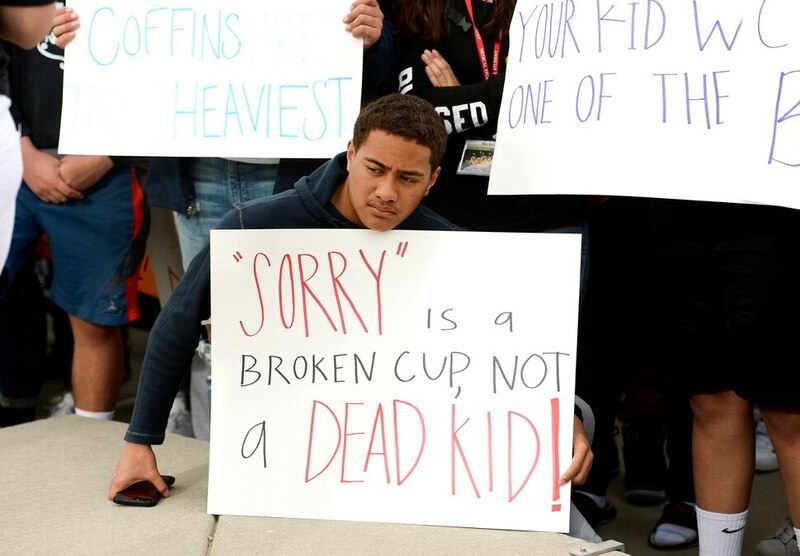 (Leah Hogsten | The Salt Lake Tribune) East High School student Brandon Garcia and his classmates call for change on the front lawn of the school. Exactly one month after 17 people were killed at Marjory Stoneman Douglas High School in Parkland, survivors of the massacre joined tens of thousands of students across the United States by walking out of school, Wednesday, March 14, 2018. (Leah Hogsten | The Salt Lake Tribune) East High School students took to the sidewalk of 13th East to raise awareness and push for change. Exactly one month after 17 people were killed at Marjory Stoneman Douglas High School in Parkland, survivors of the massacre joined tens of thousands of students across the United States by walking out of school, Wednesday, March 14, 2018. (Leah Hogsten | The Salt Lake Tribune) East High School students took to the sidewalk of 13th East to raise awareness and push for change. Exactly one month after 17 people were killed at Marjory Stoneman Douglas High School in Parkland, survivors of the massacre joined tens of thousands of students across the United States by walking out of school, Wednesday, March 14, 2018. (Leah Hogsten | The Salt Lake Tribune) East High School senior, Julie Allbor painted her cheeks orange to say #enough.Exactly one month after 17 people were killed at Marjory Stoneman Douglas High School in Parkland, survivors of the massacre joined tens of thousands of students across the United States by walking out of school, Wednesday, March 14, 2018. (Leah Hogsten | The Salt Lake Tribune) Students at East High School held moments of silence and called for change in the form of registering to vote. Exactly one month after 17 people were killed at Marjory Stoneman Douglas High School in Parkland, survivors of the massacre joined tens of thousands of students across the United States by walking out of school, Wednesday, March 14, 2018. 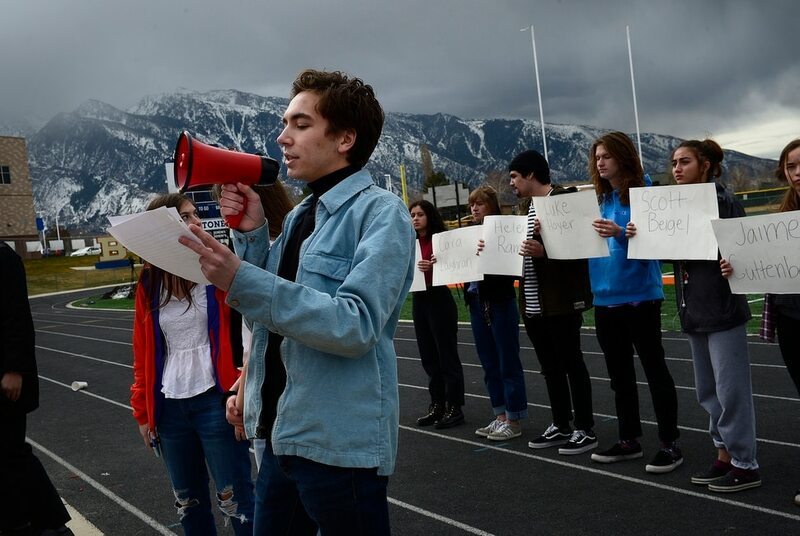 (Leah Hogsten | The Salt Lake Tribune) East High School students took to the corner of 13th East and 800 South to raise awareness and push for change. Exactly one month after 17 people were killed at Marjory Stoneman Douglas High School in Parkland, survivors of the massacre joined tens of thousands of students across the United States by walking out of school, Wednesday, March 14, 2018. (Leah Hogsten | The Salt Lake Tribune) East High School student Brian Mancilla left school to raise awareness and push for change. Exactly one month after 17 people were killed at Marjory Stoneman Douglas High School in Parkland, survivors of the massacre joined tens of thousands of students across the United States by walking out of school, Wednesday, March 14, 2018. (Leah Hogsten | The Salt Lake Tribune) l-r East High School students Nathalie Luna, Brenda Perez and Brandon Garcia took to the corner of 13th East and 800 South to raise awareness of their push for change. Exactly one month after 17 people were killed at Marjory Stoneman Douglas High School in Parkland, survivors of the massacre joined tens of thousands of students across the United States by walking out of school, Wednesday, March 14, 2018. (Leah Hogsten | The Salt Lake Tribune) East High School students took to the sidewalk of 13th East to raise awareness and push for change. Exactly one month after 17 people were killed at Marjory Stoneman Douglas High School in Parkland, survivors of the massacre joined tens of thousands of students across the United States by walking out of school, Wednesday, March 14, 2018. (Leah Hogsten | The Salt Lake Tribune) l-r Emma Glende and Ilona Wall joined their classmates in leading the protest in front of the school. East High School students Exactly one month after 17 people were killed at Marjory Stoneman Douglas High School in Parkland, survivors of the massacre joined tens of thousands of students across the United States by walking out of school, Wednesday, March 14, 2018. (Leah Hogsten | The Salt Lake Tribune) East High School sophomore Ruth Estrada made a sign that read, Come on BETSY, POTUS/VEEP, CONGRESS. DO YOUR JOB. Exactly one month after 17 people were killed at Marjory Stoneman Douglas High School in Parkland, survivors of the massacre joined tens of thousands of students across the United States by walking out of school, Wednesday, March 14, 2018. (Leah Hogsten | The Salt Lake Tribune) Students at East High School distributed #Enough pins in a call for action. Exactly one month after 17 people were killed at Marjory Stoneman Douglas High School in Parkland, survivors of the massacre joined tens of thousands of students across the United States by walking out of school, Wednesday, March 14, 2018. (Leah Hogsten | The Salt Lake Tribune) East High School student Taylor Shelton fastens an #Enough pin to her sweatshirt. Exactly one month after 17 people were killed at Marjory Stoneman Douglas High School in Parkland, survivors of the massacre joined tens of thousands of students across the United States by walking out of school, Wednesday, March 14, 2018. (Leah Hogsten | The Salt Lake Tribune) Students at East High School held moments of silence and called for change in the form of registering to vote. Exactly one month after 17 people were killed at Marjory Stoneman Douglas High School in Parkland, survivors of the massacre joined tens of thousands of students across the United States by walking out of school, Wednesday, March 14, 2018. Saratoga Springs • Kaylee Anderson said she expected “at most” 30 of her classmates at Westlake High School to participate in a national walkout on Wednesday to commemorate the victims of last month’s school shooting in Parkland, Florida. But at 10 a.m., under a light rain, roughly 80 students met Anderson at the flag pole at the Saratoga Springs school for a silent, 17-minute demonstration — one minute for each victim of the Marjory Stoneman Douglas High School attack. Exact numbers are not yet known, but the demonstration was among more than 30 school walkouts carried out along the Wasatch Front, involving thousands of Utah students. “This turnout just blew my mind,” Anderson said. (Al Hartmann | The Salt Lake Tribune) About 80 students at Westlake High School in Saratoga Springs left class and stood together in silence at the front entrance of the school Wednesday March 14, 2018 to remember the 17 students who died in a school shooting in Florida. Westlake senior and event organizer Kaylee Anderson (center) and others held posters of the names of those killed. (Al Hartmann | The Salt Lake Tribune) About 80 students at Westlake High School in Saratoga Springs left class and stood together in silence at the front entrance of the school Wednesday March 14, 2018 to remember the 17 students who died in a school shooting in Florida. They held posters of the names of those killed. (Al Hartmann | The Salt Lake Tribune) About 80 students at Westlake High School in Saratoga Springs left class and stood together in silence at the front entrance of the school Wednesday March 14, 2018 to remember the 17 students who died in a school shooting in Florida. They held posters of the names of those killed. (Al Hartmann | The Salt Lake Tribune) About 80 students at Westlake High School in Saratoga Springs left class and stood together in silence at the front entrance of the school Wednesday March 14, 2018 to remember the 17 students who died in a school shooting in Florida. They held posters of the names of those killed. (Al Hartmann | The Salt Lake Tribune) About 80 students at Westlake High School in Saratoga Springs left class and stood together in silence at the front entrance of the school Wednesday March 14, 2018 to remember the 17 students who died in a school shooting in Florida. They held posters of the names of those killed. (Al Hartmann | The Salt Lake Tribune) School rescource officers sprint to the front entrance at Westlake High School in Saratoga Springs to break up a fight between two students after 80 students left class and stood together in silence at the front entrance of the school Wednesday March 14, 2018 to remember the 17 students who died in a school shooting in Florida. (Al Hartmann | The Salt Lake Tribune) Logan Storey, a junior speaks why he joined about 80 students at Westlake High School in Saratoga Springsthat left class and stood together in silence at the front entrance of the school Wednesday March 14, 2018 to remember the 17 students who died in a school shooting in Florida. They held posters of the names of those killed. (Al Hartmann | The Salt Lake Tribune) About 80 students at Westlake High School in Saratoga Springs left class and stood together in silence at the front entrance of the school Wednesday March 14, 2018 to remember the 17 students who died in a school shooting in Florida. They held posters of the names of those killed. (Al Hartmann | The Salt Lake Tribune) About 80 students at Westlake High School in Saratoga Springs left class and stood together in silence at the front entrance of the school Wednesday March 14, 2018 to remember the 17 students who died in a school shooting in Florida. They held posters of the names of those killed. (Al Hartmann | The Salt Lake Tribune) About 80 students at Westlake High School in Saratoga Springs left class and stood together in silence at the front entrance of the school Wednesday March 14, 2018 to remember the 17 students who died in a school shooting in Florida. They held posters of the names of those killed. (Al Hartmann | The Salt Lake Tribune) About 80 students at Westlake High School in Saratoga Springs left class and stood together in silence at the front entrance of the school Wednesday March 14, 2018 to remember the 17 students who died in a school shooting in Florida. They held posters of the names of those killed. (Al Hartmann | The Salt Lake Tribune) About 80 students at Westlake High School in Saratoga Springs left class and stood together in silence at the front entrance of the school Wednesday March 14, 2018 to remember the 17 students who died in a school shooting in Florida. They held posters of the names of those killed. 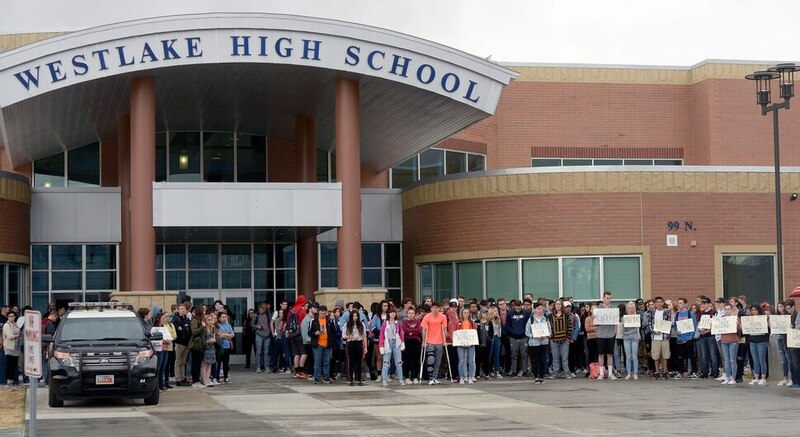 (Al Hartmann | The Salt Lake Tribune) Kaylee Anderson organized about 80 students at Westlake High School in Saratoga Springs that stood together in silence at the front entrance of the school Wednesday March 14, 2018 to remember the 17 students who died in a school shooting in Florida. They held posters of the names of those killed. 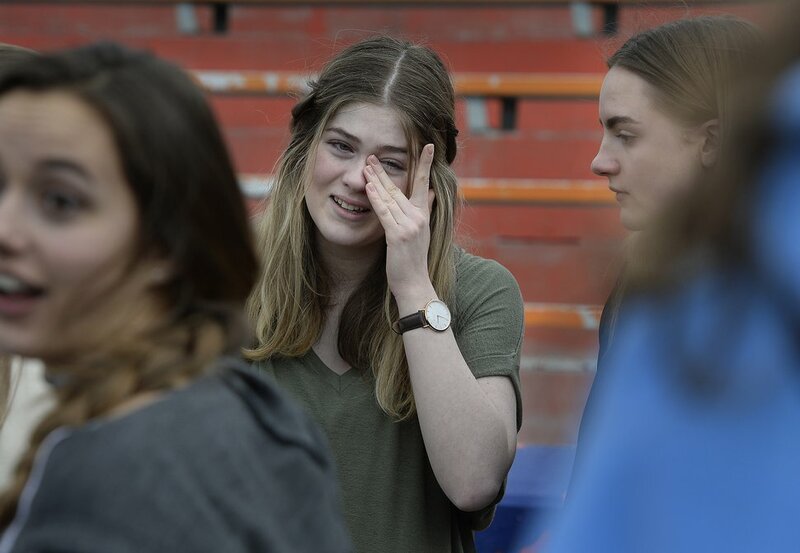 (Al Hartmann | The Salt Lake Tribune) Emily Frost, a student body vice-president speaks about at Westlake High School 's response to honor the 17 students who died in a school shooting in Florida. Afterward, as Westlake students headed back inside the school, shouts shattered the silence as bodies were pushed against the entry doors and police officers rushed in to stop a fight that had broken out. 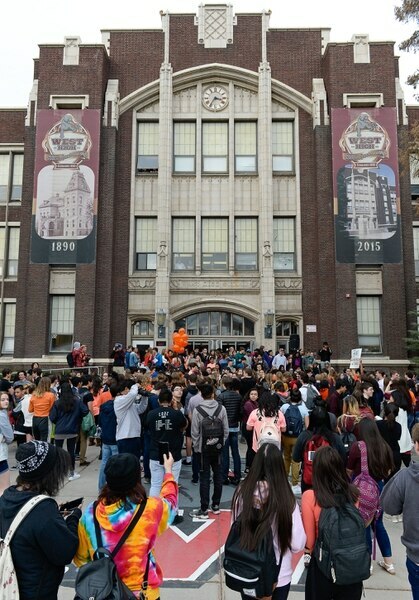 The incident was beyond the view of the media attending the event, but student and adult witnesses said several punches were thrown after a male student critical of the walkout confronted participants. Anderson said it was the first and only violence she had seen related to the walkout, but not the first instance of opposition. Almost from the moment she started organizing the demonstration, she said, critics commented on her social media posts, texted her, and muttered as they passed her in the hallways that she was stupid and wasting her time. 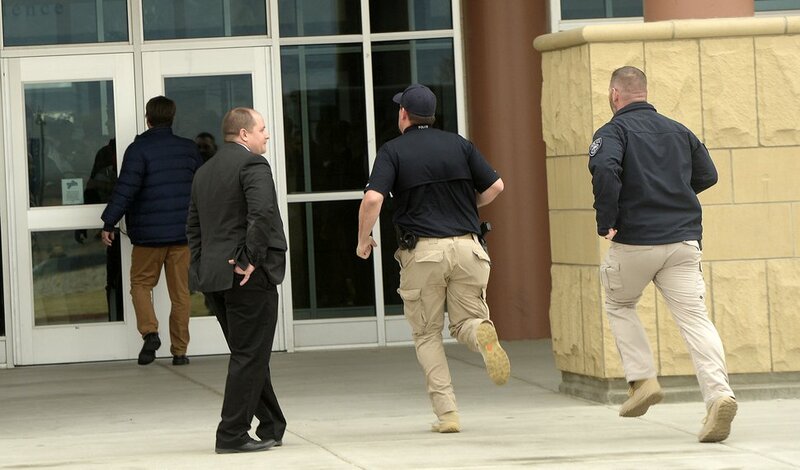 (Al Hartmann | The Salt Lake Tribune) School rescource officers sprint to the front entrance at Westlake High School in Saratoga Springs to break up a fight between two students after 80 students left class and stood together in silence at the front entrance of the school Wednesday March 14, 2018 to remember the 17 students who died in a school shooting in Florida. Nationally, organizers say there were nearly 3,000 walkouts Wednesday from Maine to Hawaii in what may be one of the biggest demonstrations yet of U.S. student activism to emerge since the Parkland deaths. 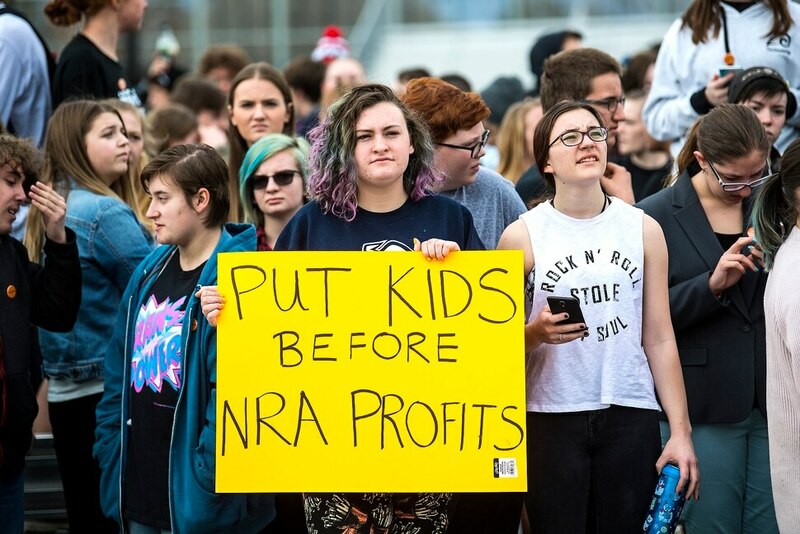 In Utah, the student-led demonstrations were individually organized, largely with the permission or accommodation from Utah’s school district administrators. 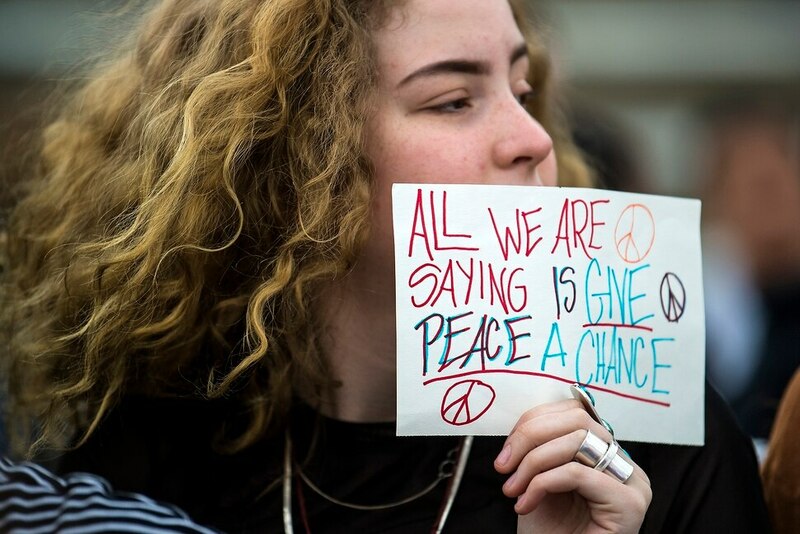 Groups offered a variety of reasons for joining in, from showing solidarity with survivors to a critique of the nation’s gun laws and calls for enhanced safety measures on school campuses. Most of the Utah protests were wrapped up within an hour or less as a soft rain continued to fall over northern portions of the state. 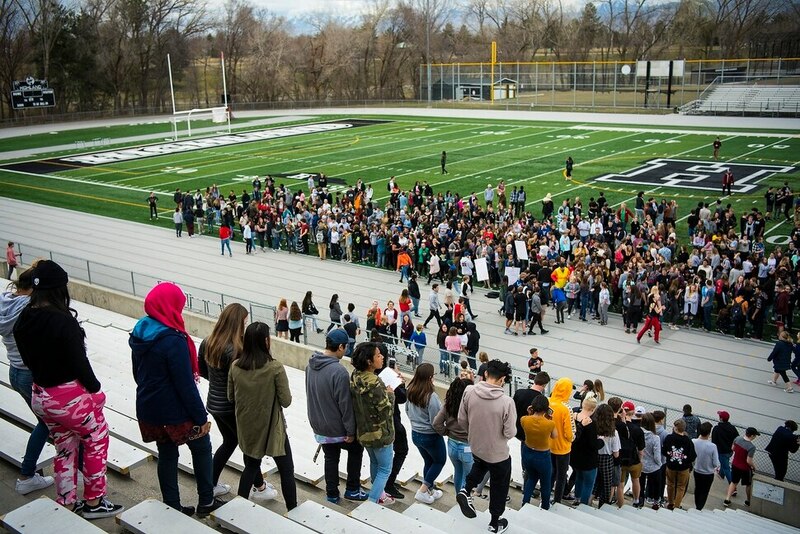 At Brighton High School in Cottonwood Heights, nearly 100 students streamed onto the football field and filled the bleachers. Names of Parkland victims were called out and students listened in somber silence. School staffers looked on — with one translating for sign-language speakers — as participants later chanted and sang. Brighton senior Meghan Taylor, 17, was crying after the protest. Her friend Meg Flynn, 18, comforted her while they stood on the field. She said she was surprised how many students joined the walkout and took moments of silence for the victims. “We are these kids,” Taylor said. Scott Sommerdorf | The Salt Lake Tribune Meghan Taylor wipes away some tears after she and other students observed a minute of silence for each of the 17 students and staff killed at Marjory Stoneman Douglas High School, during their walkout at Brighton High School, Wednesday, March 14, 2018. News media members were prohibited from visiting some campuses during the walkouts, including all the schools in Davis County School District. But at other schools, students and administrators welcomed publicity, seeing it as a way to convey their message. 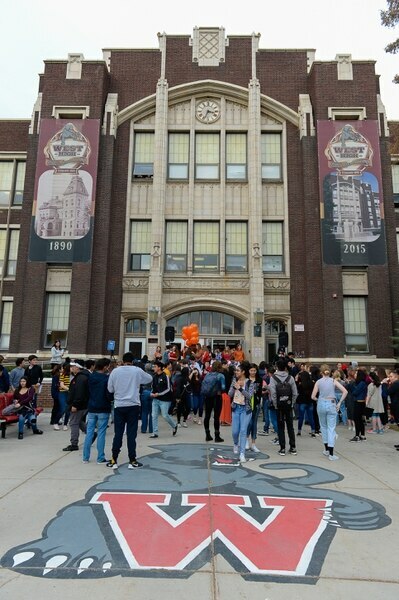 And many administrators elected to sponsor a “Walk Up” — either instead of or in addition to the walkouts — in which students were encouraged to introduce themselves to unfamiliar classmates and seek out new friendships. Logan Story, a Westlake junior who also participated in the walkout, said the school’s “Walk Up” campaign was a welcome addition to the student-led demonstration. Anderson said she’s sensitive to the issue of gun violence and public safety. Her mother was a participant during the 2013 Boston Marathon that was attacked by bombers. She said she occasionally worries about her own safety at school and is easily startled by loud noises, including the celebratory cannons at a Brigham Young University football game. Wednesday’s walkouts were the first in a series of planned events related to school safety and gun violence. On March 24, Utah students plan to march to the Utah Capitol in conjunction with the national March For Our Lives in Washington. And similar walkouts are planned for April 20, the 19th anniversary of the Columbine High School massacre in Columbine, Colo. In Utah, legislative leaders recently convened a school safety commission, which is expected to discuss and eventually recommend policy changes to bolster public safety. The commission’s creation was tied to a so-called “red flag” bill before the Utah Legislature that would have allowed seizure of weapons if a court determined someone to be a danger to themselves or others. But the bill was poorly received by Utah lawmakers. Scott Sommerdorf | The Salt Lake Tribune Student organizer Isaac Reese addresses the crowd of students who walked out of class at Brighton High and gathered in the football stadium. The students read aloud the names of each of the 17 students and staff killed at Marjory Stoneman Douglas High School, during their walkout at Brighton High School, Wednesday, March 14, 2018. Scott Sommerdorf | The Salt Lake Tribune Students at Brighton High observe a minute of silence for each sign held up for all of the 17 students and staff killed at Marjory Stoneman Douglas High School, during their walkout at Brighton High School, Wednesday, March 14, 2018. Scott Sommerdorf | The Salt Lake Tribune Student organizer Isaac Reese addresses the crowd of students who walked out of class at Brighton High and gathered in the football stadium. The students read aloud the names of each of the 17 students and staff killed at Marjory Stoneman Douglas High School, during their walkout at Brighton High School, Wednesday, March 14, 2018. Scott Sommerdorf | The Salt Lake Tribune Tailyn Bradford holds up a sign with the name Aaron Fels, one of the names of the 17 students and staff killed at Marjory Stoneman Douglas High School, during their walkout at Brighton High School, Wednesday, March 14, 2018. Scott Sommerdorf | The Salt Lake Tribune Student organizer Isaac Reese addresses the crowd of students who walked out of class at Brighton High and gathered in the football stadium. The students read aloud the names of each of the 17 students and staff killed at Marjory Stoneman Douglas High School, during their walkout at Brighton High School, Wednesday, March 14, 2018. Scott Sommerdorf | The Salt Lake Tribune Brighton High students held up signs with names on both sides as the names of each of the 17 students and staff killed at Marjory Stoneman Douglas High School, were read aloud during their walkout at Brighton High School, Wednesday, March 14, 2018. Scott Sommerdorf | The Salt Lake Tribune Student organizer Isaac Reese reads through each of the 17 students and staff killed at Marjory Stoneman Douglas High School, during their walkout at Brighton High School, Wednesday, March 14, 2018. Scott Sommerdorf | The Salt Lake Tribune Students at Brighton High observe a minute of silence for each sign held up for all of the 17 students and staff killed at Marjory Stoneman Douglas High School, during their walkout at Brighton High School, Wednesday, March 14, 2018. Scott Sommerdorf | The Salt Lake Tribune James Grace Mackey, left, and Dahlia Dangerfield, Brighton High students hug as students who walked out of class head back to school after coming together to observe a moment of silence for each of the 17 students and staff killed at Marjory Stoneman Douglas High School, during their walkout at Brighton High School, Wednesday, March 14, 2018. Scott Sommerdorf | The Salt Lake Tribune Meghan Taylor wipes away some tears after she and other students observed a minute of silence for each of the 17 students and staff killed at Marjory Stoneman Douglas High School, during their walkout at Brighton High School, Wednesday, March 14, 2018. Scott Sommerdorf | The Salt Lake Tribune at Brighton High School, Wednesday, March 14, 2018. Scott Sommerdorf | The Salt Lake Tribune Students at Brighton High observe a minute of silence for each of the 17 students and staff killed at Marjory Stoneman Douglas High School, during their walkout at Brighton High School, Wednesday, March 14, 2018. Scott Sommerdorf | The Salt Lake Tribune Students at Brighton High observe a minute of silence for each sign held up for all of the 17 students and staff killed at Marjory Stoneman Douglas High School, during their walkout at Brighton High School, Wednesday, March 14, 2018. Scott Sommerdorf | The Salt Lake Tribune Students at Brighton High observe a minute of silence for each sign held up for all of the 17 students and staff killed at Marjory Stoneman Douglas High School, during their walkout at Brighton High School, Wednesday, March 14, 2018. (Scott Sommerdorf | The Salt Lake Tribune) Students at Brighton High School in Cottonwood Heights hold cards with the names of those killed during a school shooting in Parkland, Fla., as they participate in a nationwide demonstration for better gun safety laws on March 14, 2018. (Scott Sommerdorf | The Salt Lake Tribune) Students at Brighton High School in Cottonwood Heights hold cards with the names of those killed during a school shooting in Parkland, Fla., as they participate in a nationwide demonstration for better gun safety laws on March 14, 2018. (Scott Sommerdorf | The Salt Lake Tribune) Students at Brighton High School in Cottonwood Heights hold cards with the names of those killed during a school shooting in Parkland, Fla., as they participate in a nationwide demonstration for better gun safety laws on March 14, 2018. (Scott Sommerdorf | The Salt Lake Tribune) Students at Brighton High School in Cottonwood Heights start to gather to participate in a nationwide demonstration for better gun safety laws on March 14, 2018. (Chris Detrick | The Salt Lake Tribune) Students at Highland High School in Salt Lake City gather on the football field to participate in a nationwide demonstration for better gun safety laws Thursday, March 15, 2018. Students at more than 30 schools along the Wasatch Front, nearly all of them high schools, particiapted in the 17-minute walkout — one minute for each of the Florida students killed. (Chris Detrick | The Salt Lake Tribune) Students at Highland High School in Salt Lake City gather on the football field to participate in a nationwide demonstration for better gun safety laws Thursday, March 15, 2018. Students at more than 30 schools along the Wasatch Front, nearly all of them high schools, particiapted in the 17-minute walkout — one minute for each of the Florida students killed. (Chris Detrick | The Salt Lake Tribune) Students at Highland High School in Salt Lake City gather on the football field to participate in a nationwide demonstration for better gun safety laws Thursday, March 15, 2018. Students at more than 30 schools along the Wasatch Front, nearly all of them high schools, particiapted in the 17-minute walkout — one minute for each of the Florida students killed. (Chris Detrick | The Salt Lake Tribune) Students at Highland High School in Salt Lake City gather on the football field to participate in a nationwide demonstration for better gun safety laws Thursday, March 15, 2018. Students at more than 30 schools along the Wasatch Front, nearly all of them high schools, particiapted in the 17-minute walkout — one minute for each of the Florida students killed. (Chris Detrick | The Salt Lake Tribune) Student Organizer Ermiya Fanaeian speaks during a nationwide demonstration for better gun safety laws at Highland High School in Salt Lake City Thursday, March 15, 2018. Students at more than 30 schools along the Wasatch Front, nearly all of them high schools, particiapted in the 17-minute walkout Ñ one minute for each of the Florida students killed. (Chris Detrick | The Salt Lake Tribune) Senior Zina Runyan participates in a nationwide demonstration for better gun safety laws at Highland High School in Salt Lake City Thursday, March 15, 2018. Students at more than 30 schools along the Wasatch Front, nearly all of them high schools, particiapted in the 17-minute walkout Ñ one minute for each of the Florida students killed. (Chris Detrick | The Salt Lake Tribune) Student Organizer Ermiya Fanaeian speaks during a nationwide demonstration for better gun safety laws at Highland High School in Salt Lake City Thursday, March 15, 2018. Students at more than 30 schools along the Wasatch Front, nearly all of them high schools, particiapted in the 17-minute walkout Ñ one minute for each of the Florida students killed. 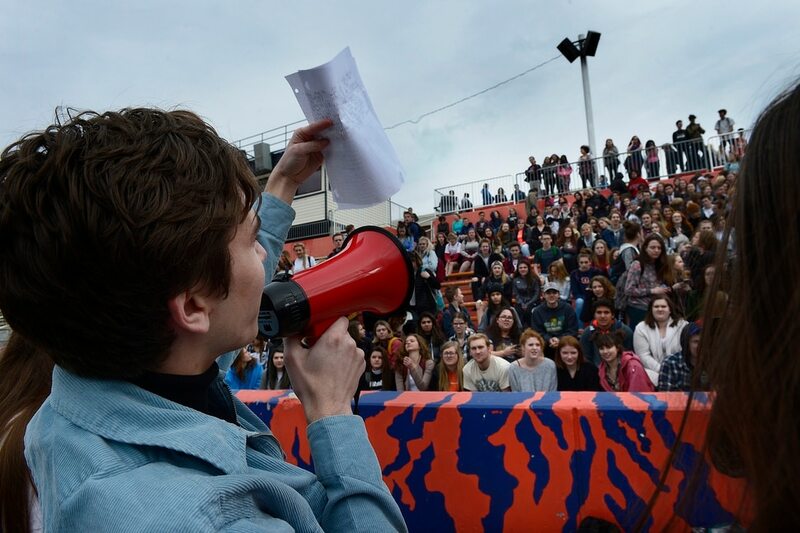 (Chris Detrick | The Salt Lake Tribune) Freshman Ben Malovich participates in a nationwide demonstration for better gun safety laws at Highland High School in Salt Lake City Thursday, March 15, 2018. Students at more than 30 schools along the Wasatch Front, nearly all of them high schools, particiapted in the 17-minute walkout — one minute for each of the Florida students killed. (Chris Detrick | The Salt Lake Tribune) Students at Highland High School in Salt Lake City gather on the football field to participate in a nationwide demonstration for better gun safety laws Thursday, March 15, 2018. Students at more than 30 schools along the Wasatch Front, nearly all of them high schools, particiapted in the 17-minute walkout — one minute for each of the Florida students killed. (Chris Detrick | The Salt Lake Tribune) Senior Zina Runyan participates in a nationwide demonstration for better gun safety laws at Highland High School in Salt Lake City Thursday, March 15, 2018. Students at more than 30 schools along the Wasatch Front, nearly all of them high schools, particiapted in the 17-minute walkout Ñ one minute for each of the Florida students killed. (Chris Detrick | The Salt Lake Tribune) Students at Highland High School in Salt Lake City gather on the football field to participate in a nationwide demonstration for better gun safety laws Thursday, March 15, 2018. Students at more than 30 schools along the Wasatch Front, nearly all of them high schools, particiapted in the 17-minute walkout — one minute for each of the Florida students killed. 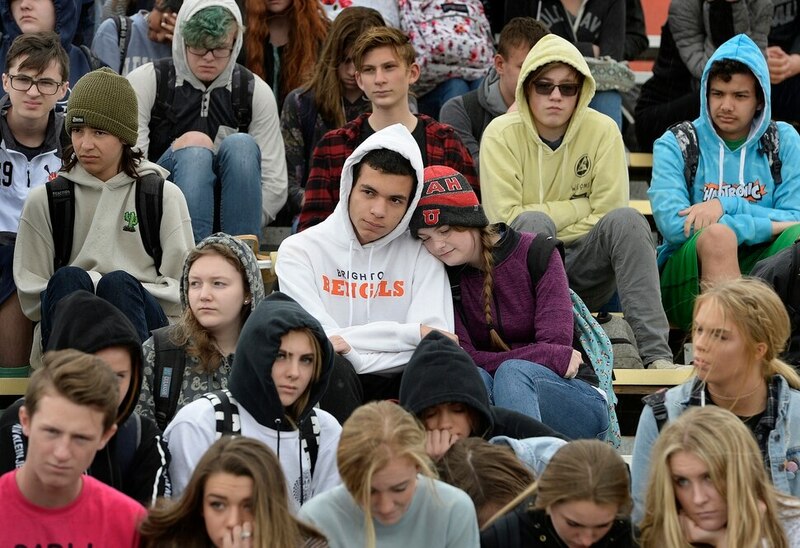 (Chris Detrick | The Salt Lake Tribune) Students at Highland High School in Salt Lake City gather on the football field to participate in a nationwide demonstration for better gun safety laws on March 14, 2018. (Chris Detrick | The Salt Lake Tribune) Students at Highland High School in Salt Lake City gather on the football field to participate in a nationwide demonstration for better gun safety laws on March 14, 2018. (Leah Hogsten | The Salt Lake Tribune) Students at east High School in Salt Lake City gather in front of the school to participate in a nationwide demonstration for better gun safety laws on March 14, 2018. (Leah Hogsten | The Salt Lake Tribune) East High School student Edith Lutui left school to raise awareness and push for change with her classmates. Exactly one month after 17 people were killed at Marjory Stoneman Douglas High School in Parkland, survivors of the massacre joined tens of thousands of students across the United States by walking out of school, Wednesday, March 14, 2018. (Leah Hogsten | The Salt Lake Tribune) East High School student Sione Fineu left school to raise awareness and push for change with his classmates. Exactly one month after 17 people were killed at Marjory Stoneman Douglas High School in Parkland, survivors of the massacre joined tens of thousands of students across the United States by walking out of school, Wednesday, March 14, 2018. 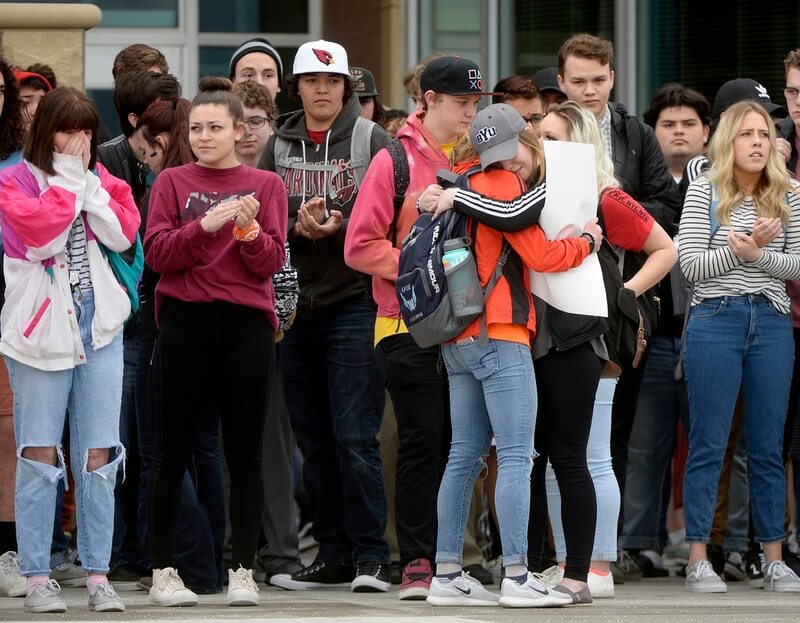 (Leah Hogsten | The Salt Lake Tribune) East High School student Brandon Garcia and his classmates call for change on the front lawn of the school. Exactly one month after 17 people were killed at Marjory Stoneman Douglas High School in Parkland, survivors of the massacre joined tens of thousands of students across the United States by walking out of school, Wednesday, March 14, 2018. (Leah Hogsten | The Salt Lake Tribune) East High School students took to the sidewalk of 13th East to raise awareness and push for change. Exactly one month after 17 people were killed at Marjory Stoneman Douglas High School in Parkland, survivors of the massacre joined tens of thousands of students across the United States by walking out of school, Wednesday, March 14, 2018. 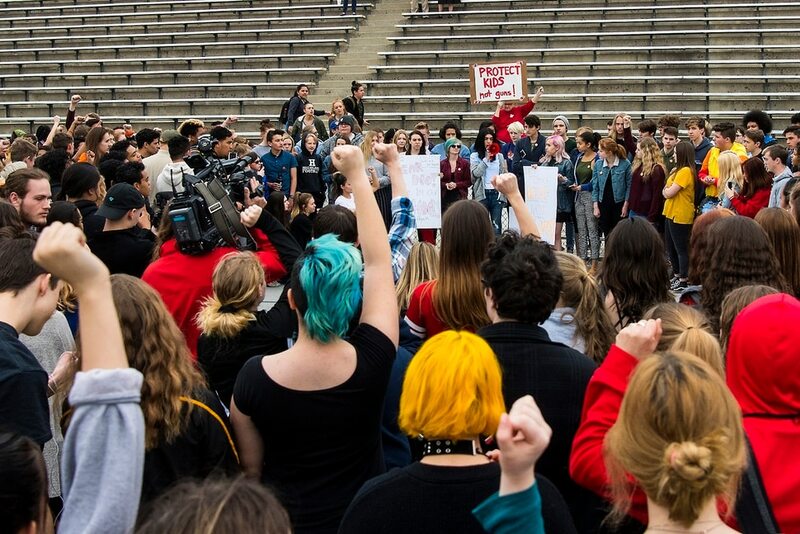 (Leah Hogsten | The Salt Lake Tribune) Students at East High School held moments of silence and called for change in the form of registering to vote. Exactly one month after 17 people were killed at Marjory Stoneman Douglas High School in Parkland, survivors of the massacre joined tens of thousands of students across the United States by walking out of school, Wednesday, March 14, 2018. (Leah Hogsten | The Salt Lake Tribune) East High School senior, Julie Allbor painted her cheeks orange to say #enough.Exactly one month after 17 people were killed at Marjory Stoneman Douglas High School in Parkland, survivors of the massacre joined tens of thousands of students across the United States by walking out of school, Wednesday, March 14, 2018. (Leah Hogsten | The Salt Lake Tribune) East High School students took to the sidewalk of 13th East to raise awareness and push for change. Exactly one month after 17 people were killed at Marjory Stoneman Douglas High School in Parkland, survivors of the massacre joined tens of thousands of students across the United States by walking out of school, Wednesday, March 14, 2018. (Leah Hogsten | The Salt Lake Tribune) East High School student Brian Mancilla left school to raise awareness and push for change. Exactly one month after 17 people were killed at Marjory Stoneman Douglas High School in Parkland, survivors of the massacre joined tens of thousands of students across the United States by walking out of school, Wednesday, March 14, 2018. (Leah Hogsten | The Salt Lake Tribune) East High School students took to the corner of 13th East and 800 South to raise awareness and push for change. Exactly one month after 17 people were killed at Marjory Stoneman Douglas High School in Parkland, survivors of the massacre joined tens of thousands of students across the United States by walking out of school, Wednesday, March 14, 2018. (Leah Hogsten | The Salt Lake Tribune) l-r East High School students Nathalie Luna, Brenda Perez and Brandon Garcia took to the corner of 13th East and 800 South to raise awareness of their push for change. Exactly one month after 17 people were killed at Marjory Stoneman Douglas High School in Parkland, survivors of the massacre joined tens of thousands of students across the United States by walking out of school, Wednesday, March 14, 2018. (Leah Hogsten | The Salt Lake Tribune) East High School students took to the sidewalk of 13th East to raise awareness and push for change. Exactly one month after 17 people were killed at Marjory Stoneman Douglas High School in Parkland, survivors of the massacre joined tens of thousands of students across the United States by walking out of school, Wednesday, March 14, 2018. (Leah Hogsten | The Salt Lake Tribune) l-r Emma Glende and Ilona Wall joined their classmates in leading the protest in front of the school. East High School students Exactly one month after 17 people were killed at Marjory Stoneman Douglas High School in Parkland, survivors of the massacre joined tens of thousands of students across the United States by walking out of school, Wednesday, March 14, 2018. (Leah Hogsten | The Salt Lake Tribune) Students at East High School held moments of silence and called for change in the form of registering to vote. Exactly one month after 17 people were killed at Marjory Stoneman Douglas High School in Parkland, survivors of the massacre joined tens of thousands of students across the United States by walking out of school, Wednesday, March 14, 2018. (Leah Hogsten | The Salt Lake Tribune) East High School student Taylor Shelton fastens an #Enough pin to her sweatshirt. Exactly one month after 17 people were killed at Marjory Stoneman Douglas High School in Parkland, survivors of the massacre joined tens of thousands of students across the United States by walking out of school, Wednesday, March 14, 2018. (Leah Hogsten | The Salt Lake Tribune) Students at East High School distributed #Enough pins in a call for action. Exactly one month after 17 people were killed at Marjory Stoneman Douglas High School in Parkland, survivors of the massacre joined tens of thousands of students across the United States by walking out of school, Wednesday, March 14, 2018. (Leah Hogsten | The Salt Lake Tribune) East High School sophomore Ruth Estrada made a sign that read, Come on BETSY, POTUS/VEEP, CONGRESS. DO YOUR JOB. Exactly one month after 17 people were killed at Marjory Stoneman Douglas High School in Parkland, survivors of the massacre joined tens of thousands of students across the United States by walking out of school, Wednesday, March 14, 2018. 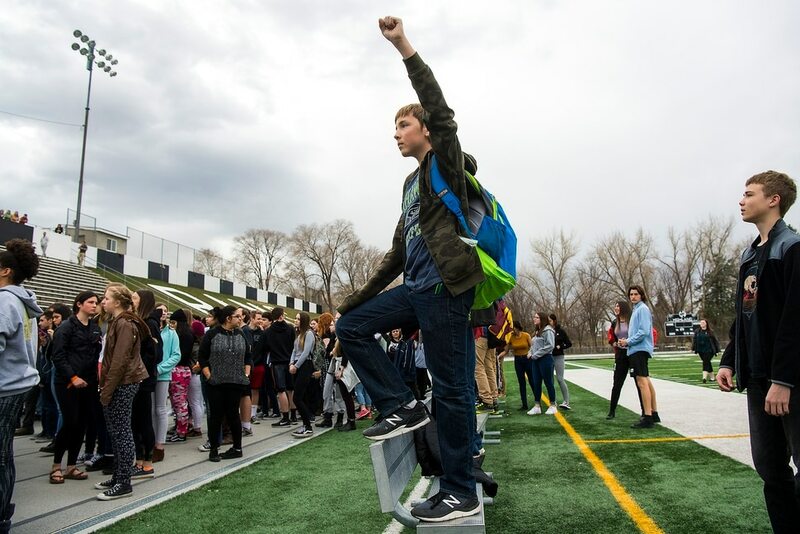 (Francisco Kjolseth | The Salt Lake Tribune) West High School 7th grader Sadie Nelson-Stippich, 12, joins fellow students after walking out of classes in Salt Lake, during a planned student walkout on Wed. March 14, 2018. Students in Utah and around the country planned the large-scale coordinated demonstration to protest gun violence and memorialize victims of last month's mass shooting at Marjory Stoneman Douglas High School in Parkland, Fla. (Francisco Kjolseth | The Salt Lake Tribune) West High School students walk out of classes in Salt Lake, during a student walkout on Wed. March 14, 2018. Students in Utah and around the country planned the large-scale coordinated demonstration to protest gun violence and memorialize victims of last month's mass shooting at Marjory Stoneman Douglas High School in Parkland, Fla. (Francisco Kjolseth | The Salt Lake Tribune) West High School students walk out of classes in Salt Lake, during a student walkout on Wed. March 14, 2018. Students in Utah and around the country planned the large-scale coordinated demonstration to protest gun violence and memorialize victims of last month's mass shooting at Marjory Stoneman Douglas High School in Parkland, Fla. (Francisco Kjolseth | The Salt Lake Tribune) Balloons representing the 17 killed in last month's mass shooting at Marjory Stoneman Douglas High School in Parkland, Fla., are released by West High School students in Salt Lake, during a student walkout on Wed. March 14, 2018. Students in Utah and around the country planned the large-scale coordinated demonstration to protest gun violence. (Francisco Kjolseth | The Salt Lake Tribune) Balloons representing the 17 killed in last month's mass shooting at Marjory Stoneman Douglas High School in Parkland, Fla., are released by West High School students in Salt Lake, during a student walkout on Wed. March 14, 2018. Students in Utah and around the country planned the large-scale coordinated demonstration to protest gun violence. (Francisco Kjolseth | The Salt Lake Tribune) West High School sophomore Andie Madsen, 15, returns to classes following a students walk out in Salt Lake, Wednesday morning March 14, 2018. Students in Utah and around the country planned the large-scale coordinated demonstration to protest gun violence and memorialize victims of last month's mass shooting at Marjory Stoneman Douglas High School in Parkland, Fla. (Francisco Kjolseth | The Salt Lake Tribune) West High School students walk out of classes in Salt Lake, during a student walkout on Wed. March 14, 2018. Students in Utah and around the country planned the large-scale coordinated demonstration to protest gun violence and memorialize victims of last month's mass shooting at Marjory Stoneman Douglas High School in Parkland, Fla. (Francisco Kjolseth | The Salt Lake Tribune) Balloons representing the 17 killed in last month's mass shooting at Marjory Stoneman Douglas High School in Parkland, Fla., are released by West High School students in Salt Lake, during a student walkout on Wed. March 14, 2018. Students in Utah and around the country planned the large-scale coordinated demonstration to protest gun violence. (Francisco Kjolseth | The Salt Lake Tribune) West High School students organize themselves during a student walkout on Wed. March 14, 2018. Students in Utah and around the country planned the large-scale coordinated demonstration to protest gun violence and memorialize victims of last month's mass shooting at Marjory Stoneman Douglas High School in Parkland, Fla. (Francisco Kjolseth | The Salt Lake Tribune) West High School students listen to fellow students demand for gun reform and school safety after walking out of classes in Salt Lake, during a student walkout on Wed. March 14, 2018. Students in Utah and around the country planned the large-scale coordinated demonstration to protest gun violence and memorialize victims of last month's mass shooting at Marjory Stoneman Douglas High School in Parkland, Fla. (Francisco Kjolseth | The Salt Lake Tribune) West High School sophomore Vinay Bandiatmakur, 15, joins a student walkout on Wed. March 14, 2018. Students in Utah and around the country planned the large-scale coordinated demonstration to protest gun violence and memorialize victims of last month's mass shooting at Marjory Stoneman Douglas High School in Parkland, Fla. (Francisco Kjolseth | The Salt Lake Tribune) West High School students listen to fellow students demand for gun reform and school safety after walking out of classes in Salt Lake, during a student walkout on Wed. March 14, 2018. Students in Utah and around the country planned the large-scale coordinated demonstration to protest gun violence and memorialize victims of last month's mass shooting at Marjory Stoneman Douglas High School in Parkland, Fla. (Francisco Kjolseth | The Salt Lake Tribune) West High School senior Abena Bakenra, 17, describes looking for the best places to hide every time she walks into a classroom as she talks about the need for school safety during a student walkout on Wed. March 14, 2018. Students in Utah and around the country planned the large-scale coordinated demonstration to protest gun violence and memorialize victims of last month's mass shooting at Marjory Stoneman Douglas High School in Parkland, Fla. (Francisco Kjolseth | The Salt Lake Tribune) West High School students walk out of classes in Salt Lake, during a student walkout on Wed. March 14, 2018. Students in Utah and around the country planned the large-scale coordinated demonstration to protest gun violence and memorialize victims of last month's mass shooting at Marjory Stoneman Douglas High School in Parkland, Fla. (Francisco Kjolseth | The Salt Lake Tribune) West High School junior Zeia Woodruff, 16, encourages her fellow students to register to vote during a student walkout on Wed. March 14, 2018. Students in Utah and around the country planned the large-scale coordinated demonstration to protest gun violence and memorialize victims of last month's mass shooting at Marjory Stoneman Douglas High School in Parkland, Fla. (Francisco Kjolseth | The Salt Lake Tribune) Balloons representing the 17 killed in last month's mass shooting at Marjory Stoneman Douglas High School in Parkland, Fla., are released by West High School students in Salt Lake, during a student walkout on Wed. March 14, 2018. Students in Utah and around the country planned the large-scale coordinated demonstration to protest gun violence. (Francisco Kjolseth | The Salt Lake Tribune) Mayor Jackie Biskupski and Police Chief Mike Brown attend the West High School student walkout on Wed. March 14, 2018. Students in Utah and around the country planned the large-scale coordinated demonstration to protest gun violence and memorialize victims of last month's mass shooting at Marjory Stoneman Douglas High School in Parkland, Fla. (Francisco Kjolseth | The Salt Lake Tribune) Students at West High School in Salt Lake City participate in a nationwide demonstration for better gun safety laws on March 14, 2018. (Francisco Kjolseth | The Salt Lake Tribune) Students at West High School in Salt Lake City distribute speech notes before participating in a nationwide demonstration for better gun safety laws on March 14, 2018.